Inspired by the Polar Boot Camp, which just concluded at the University of Minnesota’s Polar Geospatial Center, and my previous post, which discussed mapping the Arctic, Cryopolitics will now run a weekly feature discussing a satellite image of an area in the Arctic or sub-Arctic. Today’s post looks at a Landsat 8 image of the diamond mining city of Mirny, in the Sakha Republic (also known as Yakutia), located in eastern Siberia, Russia. The big hole in the image above is what was once one of the world’s biggest diamond mines: the now-defunct open-pit Mir (peace) mine. 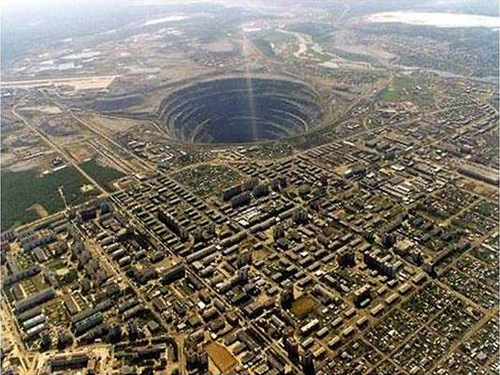 The mine makes for a visually arresting site from space given that it sits smack-dab in the middle of Mirny, a city of 40,000 people whose existence is wholly due to the discovery of diamonds. The river seen cutting across the image on an east-west parallel is the Irelyakh River. The Sakha Republic comprises approximately 20% of Russian territory. If the region were a country, it would be the eighth largest on earth by size, just below India. But by population, with only 959,000 inhabitants, it would rank 159th, below East Timor. That makes Sakha one of the least densely populated places on earth, with only Greenland, Svalbard and Jan Mayen, and the Falkland Islands ranking below it. 45% of the population are Yakuts, a Turkic people who were traditionally semi-nomadic and raised horses, cattle, and reindeer. Though there aren’t many humans in the Sakha Republic, it is chock-full of minerals. Diamonds, gold, and tin are some of the principal resources, and there are also extensive oil, gas, and coal reserves. It’s the colorless crystals, however, that really drive the economy. Economist John Tichotsky calls the region “Russia’s diamond colony” in his book by the same name. 99% of all Russian diamonds and a whopping 25% of the world’s diamonds come from this remote region in the Russian Far East. Diamond-rich, volcanically-created kimberlite pipes underlie much of Sakha – a similar geology, in fact, to the area of the Northwest Territories, Canada, where the Ekati and Diavik diamond mines operate in Arctic conditions. At 62.5° N, Mirny sits a few degrees below the Arctic Circle. Construction on the mine, which at 525 meters deep and 1,200 meters across is said to be the world’s second-largest man-made hole in the ground, began under Soviet leader Nikita Krushchev in 1957. Describing the unimaginably harsh conditions of the mine construction, I.S. Plotnikov remarks, “The winter temperatures were so low that car tires and steel would shatter and oil would freeze.” After producing some $17 billion worth of diamonds over its 44 years of operations, the so-called “pipe of peace” ceased operations in 2001. Mir was operated by state-owned mining company Alrosa, which claims to produce over a third of the world’s diamonds – thanks in no small part to its other existing operations in Sakha. In addition, Alrosa runs production sites in Arkhangelsk, also in the Russian Arctic, and the African nations of Angola and Botswana. Many of Sakha’s diamonds are sent to the world diamond capital of Antwerp, Belgium, which also happens to be Sakha’s biggest foreign trade partner. You can see from the image at the top of this post, taken by NASA’s Landsat 8 satellite, that the pit seems almost equal in size to the built-up area of the city. Landsat 8 is one of NASA’s newer satellites and was launched in 2013. The satellite has 11 bands, each of which senses different ranges of the electromagnetic spectrum. Mapbox has a great description of the satellite’s capabilities. The data is freely available for anyone in the world to download on a number of websites; I find the U.S. Geological Survey’s EarthExplorer the easiest to use. The image of Mirny was produced from Landsat 8’s panchromatic Band 8, which takes images just as a black-and-white camera would at a 15-meter resolution. This means that each pixel measures 15×15 meters. Band 8 is the highest-resolution band the satellite offers, as all other bands work at 30-meter resolution. While it’s possible to produce true-color images at 15-meter resolution from Landsat 8 by combining different bands and then sharpening them, since the image of Mirny was taken in winter, it would still appear close to black and white. You’ll also notice in the Landsat image that there are two other pits, highlighted by red arrows. 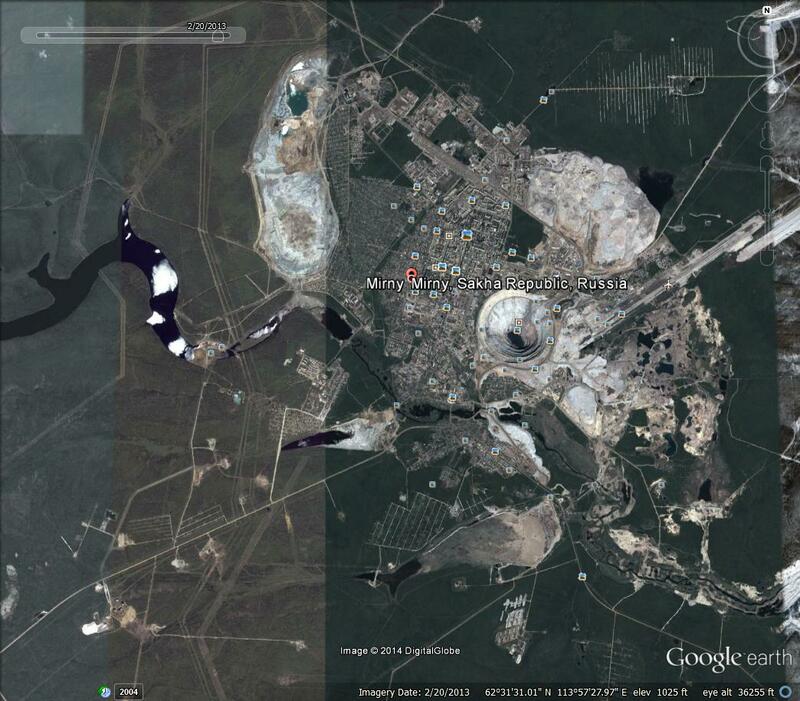 I’m not sure if operations are active at either one, though it appears that open-pit operations at Alrosa’s International Mine, on the bottom left, has closed, but underground mining might still be active. 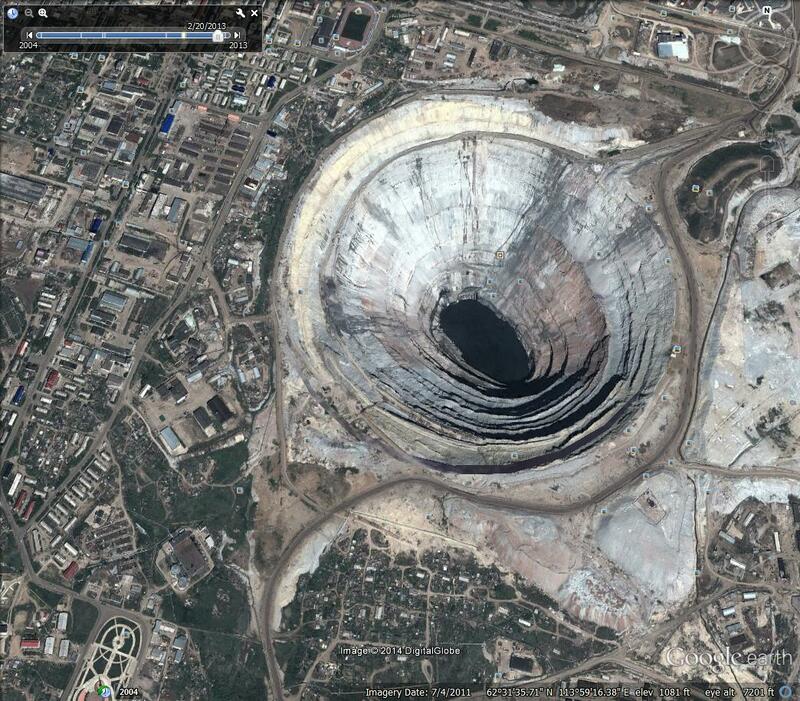 Zooming around on Google Earth (below images) gives another sense of the scale of the open pit at Mir. Big chunks of ice are even visible in the Irelyakh River to the west of the city. I had the opportunity to meet a native of Mirny, St. Petersburg State University professor Nadezhda Kharlampieva, at the Arctic in the Anthropocene summer institute in Potsdam, Germany earlier this summer. In an upcoming post, for the view from the ground, I’ll talk about her work and the Yakut people living in the Sakha Republic. For now, enjoy the view from space. Hi Mia your latest blog on the diamondmine satellite image is both fascinating and very thoughtprovoking. At this time it is particularly important that we try to understand Russia’s Arctic economy and there is so much we don’t know. Your use of and interpretation of satellite imagery is a brilliant idea and very well done, please keep it up. This is a rely fascinating post, thank you. Just a small correction: “began under Stalin in 1957.” In 1957, it would have been Khrushchev. Thanks, George. I’ll make the edit.